Facebook board member and investor Marc Andreessen has sold nearly half of his stock in the social network for $96.5 million. Over the past two weeks, Andreessen, who was an early Facebook (FB) investor, sold more than 900,000 of his shares, according to SEC filings. Andreessen is a major Silicon Valley figure, known for his Twitter rants and unfiltered commentary. A cofounder of early browser Netscape, Andreessen started venture capital firm Andreessen Horowitz with partner Ben Horowitz in 2009. In addition to Facebook, his firm has invested in Skype, Twitter (TWTR), Groupon (GRPN) and Airbnb. Andreessen continues to sit on Facebook's board and still owns more than 1.1 million shares in the company. The scheduled stock sales were part of a prearranged trading plan. Spokespeople at Facebook and Andreessen Horowitz declined to comment. Facebook's stock was up more than 1% on Tuesday to $108 a share. At a recent panel with Facebook's Sheryl Sandberg, Andreessen was asked why he appeared to use Twitter more than Facebook. 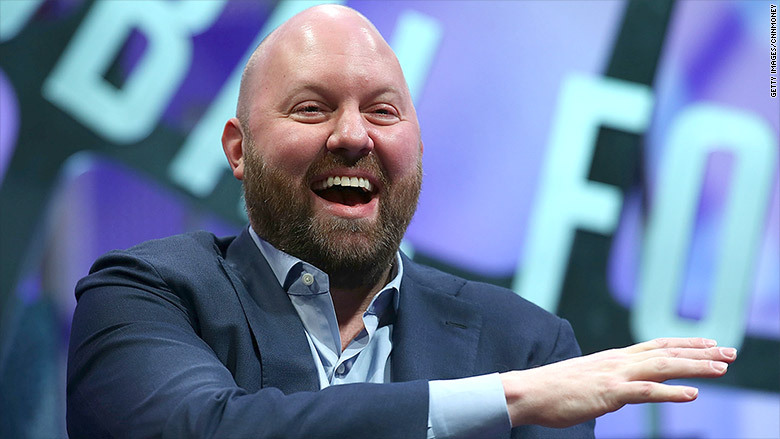 "I believe I'm doing valuable competitive analysis," joked Andreessen.